This book traces the history of a complex sexual fantasy which features recurrently in Goethe's writings from his days as a student in Leipzig to the final years as Europe's most celebrated living poet. Simpson shows how the young man's fantasy of innocent sexuality became an increasingly troubled one during the poet's first decade in Weimar. Goethe began to recognize in it a submerged element: the incestuous roots of desire. Triggered by this discovery, Goethe's imagination becomes increasingly analytic and diagnostic, and startlingly prefigures the work of Freud. Yet, paradoxically, Goethe's insight leads him to a triumphant reassertion of an innocent sexuality purged of those elements he identifies as 'diseased'. 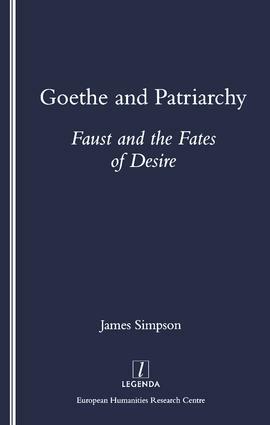 Central to "Goethe and Patriarchy" is a new account of the genesis of the first part of "Faust", which is shown to contain a record of Goethe's changing attitudes to human sexuality. In particular, Simpson is the first critic to demonstrate that the Gretchen episode is a deliberate "Kontrafaktur" of the patriarchal idyll of the "Song of Songs". The book explores numerous other Goethe texts and casts entirely new light on his creative imagination.